1. To make the pesto, place the basil, rocket, pine nuts, parmesan, garlic, olive oil and lemon juice in a food processor and pulse a few times to combine. Continue to pulse to your desired consistency. If you want a looser pesto, add more oil and pulse again. When you are happy with the texture, taste and season with salt and pepper. 2. Bring a saucepan of water to the boil and add the vinegar. Lower the heat to a little more than a simmer. Break an egg into a small bowl or mug (this will make it easier to place the egg in the water). Stir the water in the pan to create a vortex, then tip in the egg. Cook for 2 minutes and 15 seconds for a runny yolk or for 30 seconds longer for a firm yolk. Remove the poached egg with a slotted spoon and drain on paper towel. Repeat with the remaining eggs. 3. Place the prosciutto onto a baking tray and grill for 1–2 minutes on each side until crispy. 4. Toast the slices of sourdough. 5. 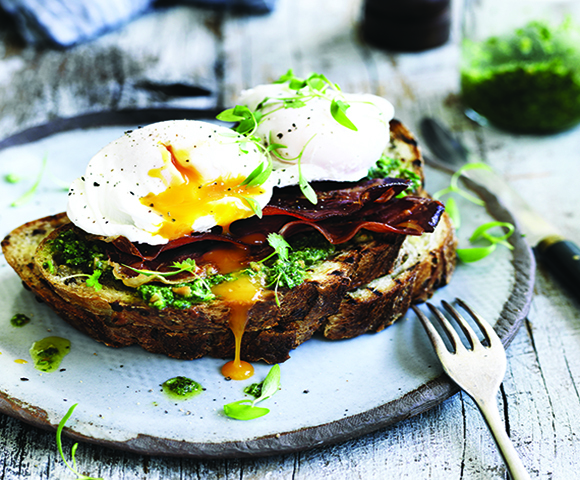 Spread the toasted sourdough with the pesto, top with some crispy prosciutto, two poached eggs and a sprinkle of micro herbs.